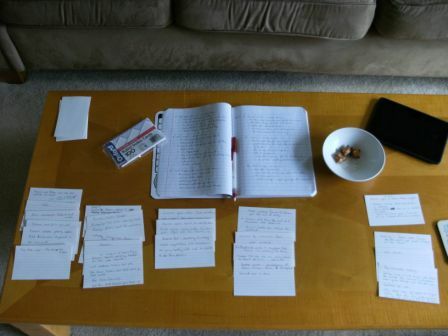 When I write, I have a bunch of scenes in my head or points that I know need to be made. Sometimes they come in orderly fashion, but often they’re a jumble. There are always holes on how to get from one place to another. That’s when I know I have to sit down and think everything through before I write one more word. Today was one of those days. Then I stare and sort. Add a card here, move a card there. Stare some more. Get rid of something that’s cool, but doesn’t fit. Save it for another time. Take care of a supporting player, add some foreshadowing, shuffle the remaining cards… Etc. etc. And so it goes until I’ve got a pretty darn good map to get me to the end of the book. Sometimes it works well (like today). Other times I just want to throw the cards at the wall. 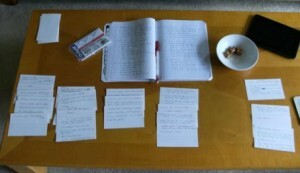 Then I have to figure out another way to get the thoughts out of my head and onto paper. And yes, whatever method I end up using, peanut butter-filled pretzels do help. Hi, Dianna. I just wish it didn’t drive me so crazy!